French pianist David Grinbaum has thankfully returned to his musical roots after a brief stint in the business world to pursue his passion of cinematic composition. His talents are laudable and Main Dans La Main showcases a pleasurable variety of his works. In addition to his exhilarating melodic ideas, Grinbaum’s eclectic instrument choices are gratifying. “Active in Reflection” takes the listener on an aural journey that could fit in a number of different thematic settings. The opening eerie flute sounds like the wind whistling through the stone walls of an abandoned abbey. Then a syncopated wooden rhythm begins beating cutting through the gloom. Additional countermelodies are added and soon the excitement swells to the colorful outpourings of a Bollywood film. Hinting at a more Middle Eastern flair is “Slow Motion Memories.” The fiddle playing has a slight Klezmer styling and the choir in the finale is practically drowning in reverb. A deranged ticking clock opens “Time Goes, Time Flies” before the piano upbeats become running eighth notes. The tempo is steady as the diminution continues with a minimalist approach as the ivories tinkle sixteenth notes with long held flute tones accented by percussive wooden downbeats. Grinbaum has the quality to make the title of his works radiate through the sounds of his music. His engaging composition style is warm, inviting, dramatic and easy to digest. By the time the high strings enter into the piece it becomes reminiscent of the ending credits of a romantic comedy. 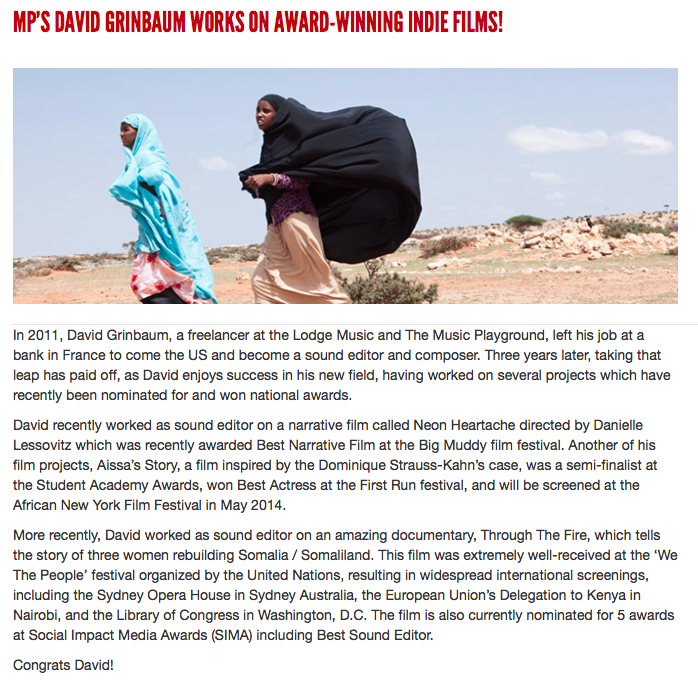 Grinbaum’s music is purposeful and could stand alone even without a movie to accompany it. The lullaby “Living A Dream” is a peaceful trio of piano, flute and glockenspiel. Wind chimes usher in string pedal tones and the sweeping violin solo at the conclusion is soulful and poignant. “Welcome In Our World” takes the listener through deep space with an underlying stalking vibe. The intense strings herald more tension and perhaps a chase sequence is on the verge of ensuing. At this point however, the song suffers from a bit of repetition. The redemptive sounding “There Shall Be Three” could be from a nautical adventure or some sort of hero’s tale. The three note ascending piano motif at the beginning of “Dark Among Other Things” is not entirely gripping. However, Grinbaum cleverly adds a fuzzy electric guitar in stark contrast giving a haunting sensation to the piece. By the time the strings enter, a science fiction genre may be more appropriate. In Main Dans La Main David Grinbaum clearly demonstrates the thematic flair to his writing and is well versed in many different styles and instrument families. Hopefully one day his fun and inventive music will become the soundtracks to future memorable films.